ASA members receive a 20% discount on SAGE books. Use promotion code S09ASA when ordering at www.sagepub.com or by telephone (800) 818-7243. ASA members receive a 20% discount on sociology titles published by the University of California Press. Visit UC Press at www.ucpress.edu/books/subject/socmaj.php and use the source code 10W9688 at checkout. ASA members save up to 70% on publications and merchandise through the ASA online bookstore at www.asanet.org. Order the ASA Style Guide, save $5 on the Sociologist’s Book of Cartoons, or improve your teaching with one of ASA’s renowned sets of syllabi and instructional materials. Use your ASA ID and password to order and be sure to visit the “On Sale” and “New Items” sections. 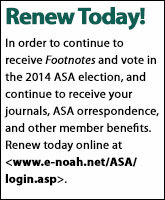 If you have not renewed your membership for 2014, please do so today in order to continue to receive copies of Footnotes and other member benefits! You can renew online at https://asa.enoah.com/. For complete information on these and other ASA member benefits, visit www.asanet.org/benefits.